"This is great served over ice cream, cake or pudding"
Remove from heat and stir in water, a little at a time, until sauce reaches desired consistency. Cool slightly and stir in vanilla. Serve. I made this with 6 ounces of semisweet chocolate, reduced the water to 3 tablespoons and added 2 tablespoons of butter to it. Very yummy. This recipe tastes more like chocolate pudding than Fudge sauce. Water can be eliminated for a thicker sauce. Good recipe for kids, not for hot fudge sundaes. 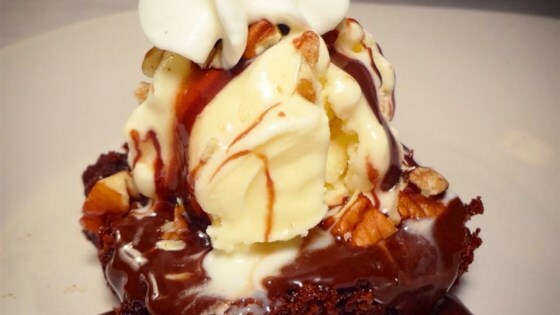 This is the best hot fudge sauce I have ever made! I didn't need to add the water. I have made it with both unsweetened and semi-sweet chocolate. Slightly different flavors--both excellent! I Made with no water and it was thick, creamy and everyone at my party was astonished it was homemade. The hot fudge brownie sundaes were a hit! I was disappointed in this hot fudge sauce. It was very runny and not very fudgy tasting. I probably wouldn't make it again. Very thin and not rich/chocolatey enough for me.